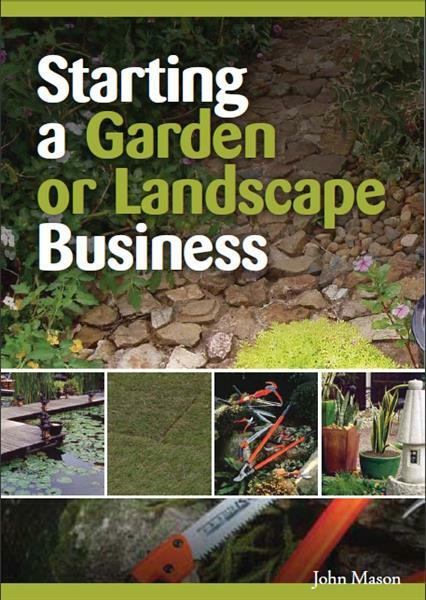 The Starting a Garden or Landscape Business ebook provides a wealth of practical information on what you would need to consider when starting such a business. Expert advice on how to get started in your own garden or landscape business! Learn how to start small and grow into a full time enterprise whilst staying grounded and inspired. This ebook is packed with valuable business advice, horticultural and landscaping knowledge and practical ideas- download it today. What Sorts Of Records Do I Need To Keep? CHAPTER 2 WHAT SERVICES COULD YOU OFFER? What Do You Need To Offer These Services? CHAPTER 2: WHAT SERVICES COULD YOU OFFER? working, leaving less time for gardening. With two wages, they are better able to afford to pay someone to do their gardening jobs. Normally done on a weekly or fortnightly basis in the active growing seasons – less often in winter. May include trimming edges on each cut, on every second or third cut, or not at all. May be a 'quality cut' service, for top quality lawns using top-quality cylinder mowers. May be a basic cutting service using a standard rotary-type mower. You may or may not be required to remove lawn clippings from the site. This service may be provided as part of a routine maintenance contract which you attend to every week, fortnight or month. Pruning is also done as a once off, or once a year job, for example, roses and deciduous fruit trees in winter. Removing unwanted branches from trees (they might be dangerous, getting too near a building, or simply not wanted by the customer). You need special equipment and skill to do this safely and properly. Insurance costs are generally quite high. A highly specialised area of tree work requiring more skill and experience than tree lopping. Sometimes a one-off job, more commonly part of a regular maintenance contract. It may involve chemical weed control (spraying) or other methods (e.g. hand weeding). Normally involves identification and spraying to control pests and diseases. May also involve other control methods. Repairing and improving an existing lawn. Involves such things as topdressing, weed control, thatch removal, aerating, feeding and watering. Usually employed on a weekly or fortnightly basis for a set number of hours to do some or all of the jobs needed to care for the garden (i.e. feeding, watering, weeding, lawn mowing, pest control, pruning, etc). Often included in a gardening job, often expected! Many gardeners do not offer this service, others do. You should clearly indicate to customers whether you do or do not remove rubbish. Normally a one-off job involving weeding, pruning, spraying, replacing dead plants, additional planting, lawn renovation and perhaps some minor landscaping. Usually a more major task than other garden services. Involves such things as earthworks, rock work, drainage, lawn construction, paving, installation of watering systems, planting, etc. Offering design advice or a full landscape plan. Often, but not always, attached to a nursery or landscaping business. Designing and installing irrigation systems. Service used by home owners, factories, companies, estate developers, councils. The move to water efficiency has seen an increase in irrigation system sales an installation in recent decades. Installing and maintaining plants in offices, buildings and display areas. Involves routine maintenance once a week in most situations. Consider all of the above options and decide which services you will offer and which you will not offer. It is strongly recommended that when dealing with the public or plants, that training in that particular field is undertaken. Some fields listed above will require registration in appropriate associations. It would be in your interest to achieve acceptance into these associations as they can promote business.